Toyota has heard one too many jokes about the Camry dent, and about how it carries the large, beige-colored flag of vanilla midsize sedans. But it’s 2017. The angles are sharper, the wheels are sportier, and Toyota wants you to stop calling its cars boring. Please. Guys. Please. 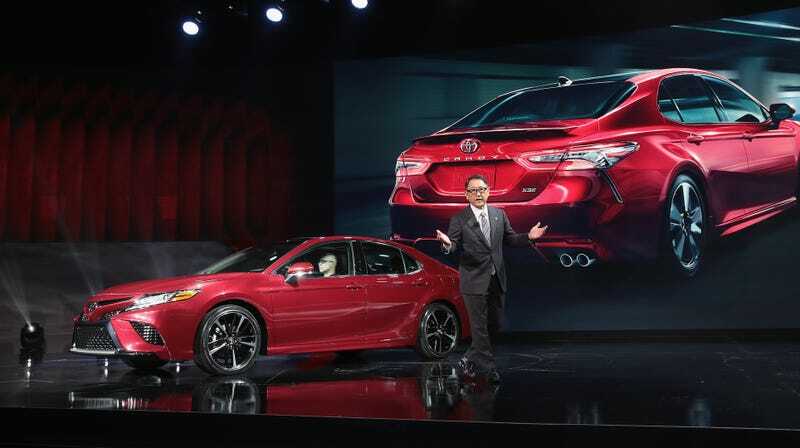 USA Today reports that Toyoda admitted that the company still has “room for improvement,” which means the Camry (and its other cars! Did you know it makes other cars? It does!) could get wilder—especially with $1.3 billion dumped into its Georgetown, Kentucky plant where a lot of the Camry upgrades will occur. How... wild! Just like Toyota these days! Toyota isn’t boring anymore. That was just a phase. Ignore it now. It is definitely not boring anymore. It won’t be your lame, everyday beige-sedan provider like it always has been. Get ready for wilder Camrys, and, maybe, fewer dents.